The Second World War officially begun on September 3, 1939. This timeline includes events that took place before that day if they are relevant to WWII. Hitler gives his speech The Jewish Question. I think you will not misunderstand the spirit of frankness in which I send you this message. Heads of great Governments in this hour are literally responsible for the fate of humanity in the coming years. They cannot fail to hear the prayers of their peoples to be protected from the foreseeable chaos of war. History will hold them accountable for the lives and the happiness of all even unto the last. At noon, Hitler delivers a hefty Reichstag address, which takes two and a half hours. One and a half hours into the speech, Hitler attends to Roosevelt's telegram from April 15, 1939, which Hitler describes as a "curious document". Hitler launches his "Euthanasia" Program, i.e. the ordered killing of "unworthy eaters." Initially, only children under the age of three who are mentally or physically handicapped qualify. From October 1939, the order will also include adults. Under the code name T4, this program will eventually arrange the murder of approx. 275,000 people. Why T4? Because the headquarters for this project was located at Tiergarten Street 4, Berlin. In the realms of the Third Reich a hot and humid summer night — and the last quiet one — ends. Europe doesn't know it yet, but it will take five years and eight months until it will be this silent again. See May 8, 1945. Today, Friday, September 1, 1939, at 4:45 a.m., the German cruiser Schleswig-Holstein, which anchored at the Danzig harbor, opened fire on the heavily-fortified Polish Westerplatte. 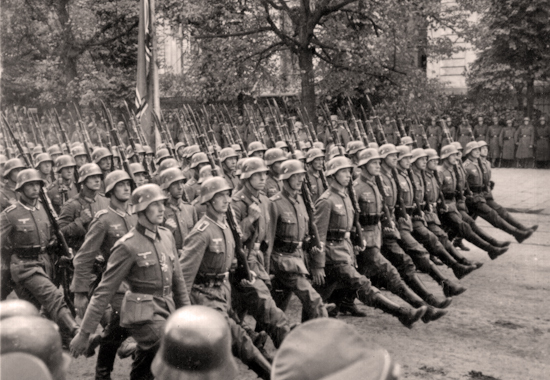 Hitler's war on Poland has begun without a declaration of war. Westerplatte, September 1, 1939, 4:50 a.m.
At 4:45 a.m., the armored cruiser Schleswig-Holstein opened fire from all cannons on the Westerplatte. Shots continue to be exchanged. In response, Polish guards blow up the Dirschau bridge across the Vistula which led from Danzig into the Corridor region. Along the entire German-Polish border and along the border of Czechoslovakia and Poland fire is exchanged. The German Luftwaffe attacks targets inside Poland. On the orders of the Führer and Reich Chancellor, the Wehrmacht has assumed the active defense of the Reich. Friday morning, in compliance with their mission to halt the Polish aggression, troops of the German Army passed all German-Polish border checkpoints to launch a counter-offensive. At this time, Luftwaffe squadrons started to put military objectives inside Poland out of action. The Navy has assumed the defense of the Baltic Sea.